You are currently browsing the Science Fiction Brewed Fresh Daily blog archives for the day Tuesday, January 11th, 2011. This is what researchers at the ATLAS detector at the Large Hadron Collider expect data from a Higgs boson to look like. The Higgs boson is the subatomic particle that scientists say gives everything in the universe mass. Deep beneath the border of France and Switzerland, the world’s most massive physics machine is sending subatomic particles smashing into each other at speeds nearing the speed of light. 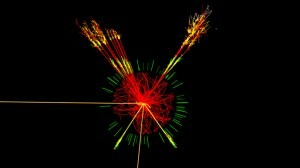 Physicists working with the 17-mile-long Large Hadron Collider hope it will help solve some of the universe’s mysteries. But first, researchers must overcome two very mundane hurdles: how to handle all of the data the LHC generates, and how to get non-scientists to care. One physicist has a novel way to solve both problems: sound.